Be afraid, be very afraid, they are trying to steal your domain name. Header set Expires "Wed, 15 Apr 2020 20:00:00 GMT" Header set Cache-Control "public"
Be afraid, be very afraid, they are trying to steal your domain name. I would be surprised if as the owner of a domain you hadn't received a few of these. 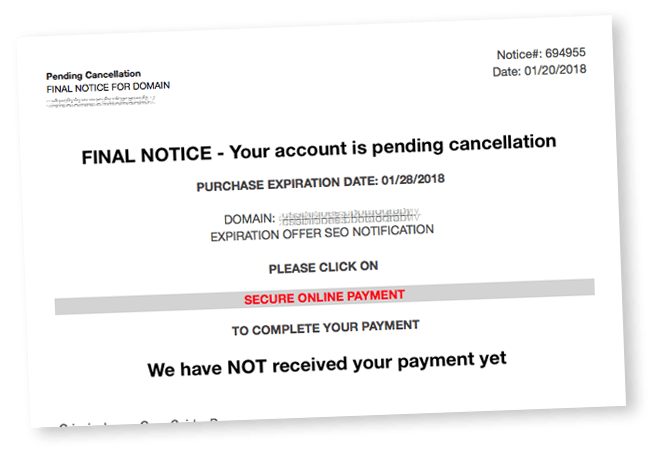 Emails purporting that your domain renewal is overdue. As the manager of a lot of domain names I get a lot of these. I also get a lot of calls from clients asking why I hadn't renewed their domain names. Basically these come from people who, at worst, are trying to steal your domain name, it is worth money. But as far as your concerned it is the key to your website, your emails and quite possibly your business. If you lose control of your domain name it can be almost impossible to get it back. I learnt my lesson in 1994 when I lost a domain name. The thieves didn't want to use it, they did want to sell it back to me for a very large sum of money. The domain name involved is protected by Trademark worldwide, but that doesn't stop them trying to extort money from me. They haven't succeeded, nor will they, and it is still available for me to buy back from these people even now. I should add, that was the first and last time anything like that has happened to me. So if you get an email suggesting you're overdue for your domain renewal, DON'T click on it anywhere, even if you think it is genuine. Go to your browser and log into whoever hosts your domain name using the details you already have and check. If you're not sure ask whoever manages your IT or website. Just, please, don't click on that email.